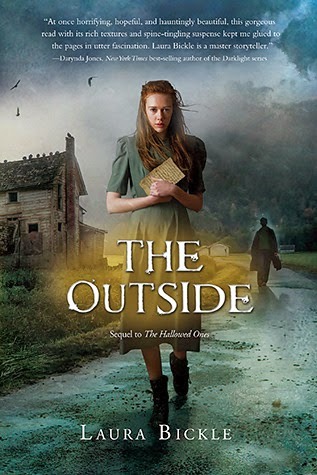 Title/Author: The Outside (The Hallowed Ones #2) by Laura Bickle. Synopsis: After a plague of vampires is unleashed in the world, Katie is kicked out of her Amish community for her refusal to adhere to the new rules of survival. Now in exile, she enters an outside world of unspeakable violence with only her two "English" friends and a horse by her side. Together they seek answers and other survivors - but each sunset brings the thread of vampire attack, and each sunrise the threat of starvation. In this edge-of-your-seat thriller, it's up to one Amish girl to save her family, her community, and the boy she loves...but what will she asked to leave behind in return? ~Goodreads.com. The hard part about the end of the world is surviving it. This is the first sentence in The Outside, the second book of The Hallowed Ones, about Katie, an Amish teen surviving a vampire apocalypse. The story picks up only a few weeks after the end of the first book and continues with action, heartache, tough choices and a tad of romance. Now that she is outside of her community, Katie still struggles with religious issues that plagued her when she lived in her own world. She hasn't been baptized so she's afraid if she dies before she is, she won't go to heaven. She also questions whether God has forgotten them because of the events that have happened. However, her experiences in the outside world and her relationship with Alex propels her to re-evaluate her world view and she realizes that her "definition of evil is shrinking." Turning toward Darkness is a gradual process, in all things. ~Katie. I found the discussion and theory of human consciousness affecting the physical world very interesting as a concept and a plot device. Could this be why religious symbols are so powerful against the vampires? Why churches and religious communities are sacred? The discovery of a vaccine against vampirism is interesting as well. This was explained to my satisfaction so it didn't seem too outlandish and it was described very well so I could experience what it was like to be innoculated and what it looked like. Again, Katie struggles with this vaccine (luminescence) and how much it will change her. However, how can you turn down protection from vampires? Her and Alex realize they have to help as many people as they can. Alex is travelling north to find his parents and Katie is compelled to go back and help her own community. She goes home to find some things have changed greatly and she again proves her worth and it seems by the end of the book she may be taking on another important role to give her home protection. I love the romance in The Outside. Alex is thoughtful and gives her choices when no one else in her life had done so. Can you imagine if your whole life you were told what to do and when to do it and then another person has enough trust in you to make your own decisions? He comes off very appealing and their date in the store was sweet. The Outside also included nice, scary imagery. The vampires are no less terrifying in this installment and I thought the nun vampires were a great touch. I won't go into what made them so creepy, because I don't want to spoil too much of the story. A few things make this book from being perfect. Some of their conversations sound like a text, not dialogue. And, when Alex tells the myths to Katie, it's a bit too deliberate and seems like he is leading a witness. When I was getting toward the end of The Outside, I felt as if it was an unnecessary sequel, but I liked how the story came full circle with a few changes. However, I started The Outside as soon as I finished The Hallowed Ones, so that is a testament to how much I liked the characters and how interesting the story is to me. I don't know if a third book will come out, but I would definitely read it. Starstruck Over: The flow of the story and the journey and development of the characters. Karen from For What It's Worth Reviews recommended these books. Read her review of The Outside. I would not have thought to combine vampires with the story of an Amish girl. Very interesting combo and I'm glad you're enjoying these books so much! Great review, thank you. I still don't know if I will ever read it though. I thought the end was a little too convenient but I still loved it. I mean after everything they've been through…it's ok.
@Kate-I thought it was very imaginative. When I first heard of it I was dubious, but it was a very easy and fun read. @Steph-Definitely an interesting concept. I wonder how this pitch session went? @Aurian-lol. If you get scared easy, I'm not sure this would be an easy read. @Karen-I can see that. I thought the end of the 1st book was a bit more convenient. I could see this one as convenient too, but yes, I still loved it as well.